I hate them owlvamp! The have such small necks and personal I use aluminum hooks and I use a lot of the hooks neck. That's funny Yarnoverforlove ... I don't have a light up crochet hook. Sounds interesting . We lost power for about 3 hours, but that was to long for me so..... I used my lighted up crochet hook. I hate it but I just had to keep crocheting lol! Kuddles, Happy Birthday fill up on a bunch of cake for us! Hey everyone! Here are a couple of pictures of my dogs. I have 3 or 4 I have not shown but yall asked so here ya go..... get ready for the cuteness! Thank You I did find the squares,tucking ends,I will stuff the largest puffy I can find, If I remember right,they hold about 50- 6 inch squares I used to send them out regulary to someone in Ohio that made blankets for foster kids,thats how I know about how many fit in a puffy ( OH and Congrats to The New Queen!) Thank You!!! I have nine dogs, and they all love yarn as though they were cats ( idk if that's a stereotype or not) but they love it. 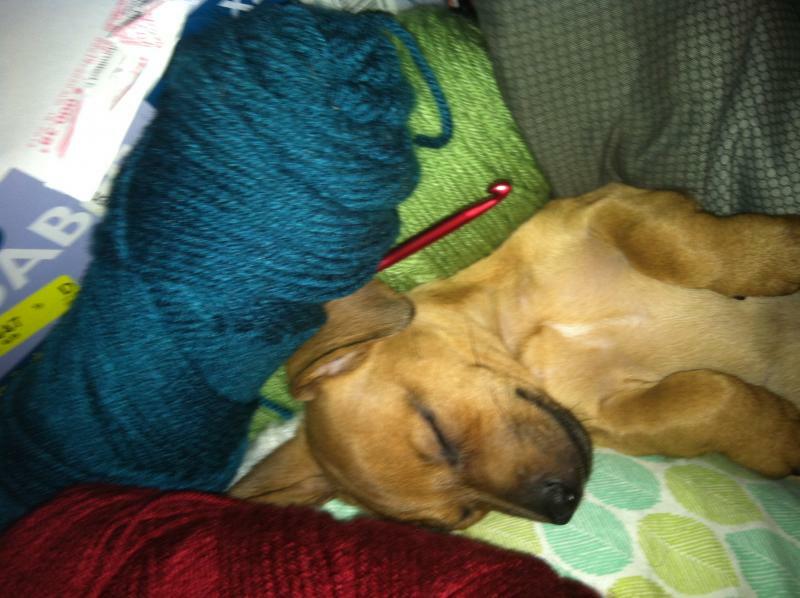 I just found my 6 week old rescue at the bottom of my yarn stash sleeping. It was too cute I had to take like six photos. Anyone else have little animals helpers?